Doctor Aphra #17 continues the hijinks as her and her motley crew goes off on another crazy mission to get back Triple Zero’s memories. This time they cross paths with General Hera Syndulla. What ensues is a bit of action, comedy and even some romantic drama. On their quest toward Hivebase-1, they first have to make a stop at Hera Syndulla’s secret Rebel pilot training facility. They pose as Rebel volunteers, though their initial plan does go exactly the way they wanted. However, they make it work and eventually pull off a kidnapping with Hera as their captor. You see, the goal is a high value hostage that may give them the leverage they need to make a deal. At least that about as much of the plan as they story lets us be privy to so far. Along the way of this kidnapping, there’s some great dialog, some nice action, and Aphra and Tolvan have another moment. Altogether, the writing is spot on and it’s a really fun story. Complementing the story is some pretty nice artwork. There’s a good variety between panels and focus shots, thus giving the reader a view of the environments and the characters, and focusing the attention where it’s most needed for each shot. It’s also yields some nice character focused panels. 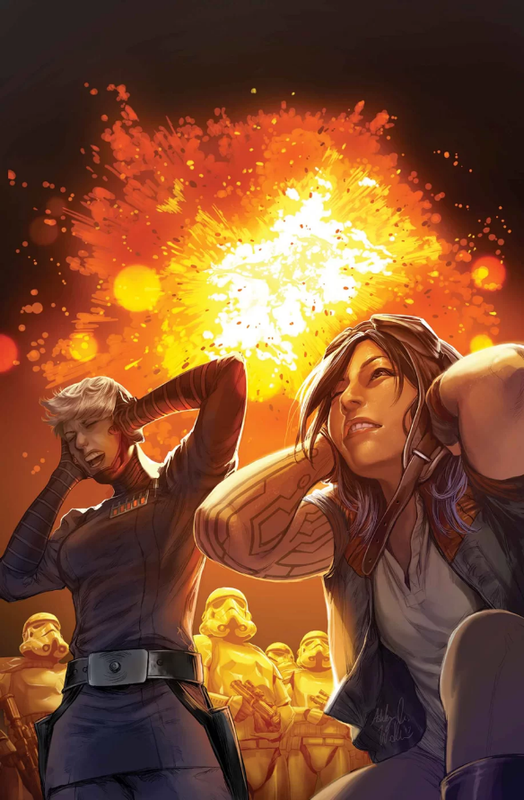 With great artwork and a great story, Doctor Aphra #17 scores high marks across the board. I give it a five out of five metal bikinis.